You are making great progress with all your projects! Your Lintilla is beautiful, and your Void and sock are looking lovely too 🙂 You get so much done! And thank you for sharing your beautiful scenery – looks like a lovely place for a walk. Absolutely have to agree – beautiful landscape, thanks for sharing! I also love how that shawlette looks on you, well done! We also have very mild temperatures here, around 15 degrees celsius – but is still below 0 (well, just -1) at night. Have a great week! The Lintilla turned out great and the views from your walk, just stunning! It’s extremely mild here in Ireland also, I’ve not been wearing a coat for most of February. The black and white shot of void really shows up the texture, it’s great, amazing when you take colour out of the equation how things can look. Beautiful Lintilla. How nice that it doesn’t come undone with a strong wind. The Hermione socks are one of my favorite patterns also. I especially like it for my husbands socks. The sea glass markers are very pretty. They would be perfect to sell at a craft show. Lintilla is beautiful and the stitch markers are gorgeous. Glad you found the non slip gel! Oooh, your Lintilla is so pretty wrapped around your neck, Liz. And the stitch pattern on the Void really does show up better in that black and white photo! Cool. And lastly… what a beautiful place you have to walk! Sigh. It looks so beautiful and springy there! We had a few days of what we call “Fool’s Spring” but we are back to below freezing temps. Lintilla is very pretty. You are so productive. 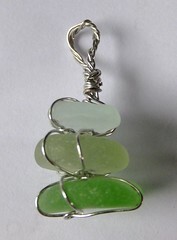 If you sell those beach glass stitch markers I will buy a set! I have to agree with everyone else: Lintilla looks very beautiful. All WIPs look great too. And I love your sea glass stitch markers. The view is stunning! Enjoy your warm spell. I spend most of the day yesterday ploughing snow and now we have a blizzard – arrrggghh. I commented here once but then our internet went down just enough to lose it. So, let me just say that your Lintilla is beautiful! It looks so nice on you too against the white. The Void is really coming along and I can definitely see the beautiful diamond pattern. Love the socks and the yarn you’re using….that is a fun pattern. 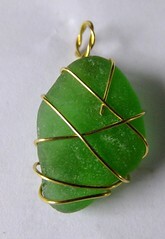 i really like the sea glass progress keepers….we are miles away from any ‘sea’ so if you sell any let us know! 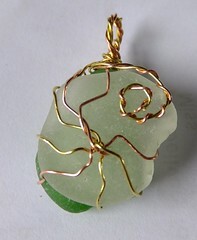 Is it real sea glass or can you buy it? Your view is gorgeous and so is your dog. I envy you Brits as you have so many beautiful places to walk. Hi, the sea glass is all collected by me on Rosemarkie beach, it’s the best place in this area to find it and I’ve become expert at spotting it. I have lots of it in different sizes. I used to only collect big bits for making a wind chime and jewellery but then started collecting the small bits when I bought my Dremel. I am going to add another link to some of them, so they hang the right way and are easier to open and close, once I have done that I will offer them for sale I think.